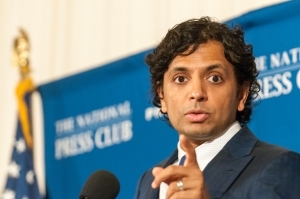 Film director M.Night Shyamalan described two different schools at the National Press Club Luncheon June 11. The first provided an “incredibly vibrant” environment, where students recognized Shyamalan and wanted to talk to him about his work.In the other school – an inner city one – he saw metal detectors, locked doors and bars on every classroom. The theater had burned down. The kids were treated like animals. The 1999 Oscar-nominated director of "The Sixth Sense” admitted that he cringes at celebrity activists. But Shyamalan was in town not to promote a new movie, but a book, "I Got Schooled," about closing the education gap in America’s inner-city schools. Shyamalan, 43, was raised in the Philadelphia suburbs by parents who are both physicians. It took two years to gather the data, he said. “We didn’t want one study. We wanted a meta study of everything,” said Shyamalan, who admitted he’s not an expert in the field. “Tell it to me so I can understand, so I can tell it to a parent,” he said. According to the director, the result was a frustrating level of blurriness with no clear path to success. Shyamalan said he could cherry pick data to support most any solution. The director said a physician friend set him in a more productive direction, which required another two years of research to answer the question, "Is there a group of factors that always work to achieve educational success?" “Lo and behold, the pile became organized into five groups,” Shyamalan said. These five keys, Shyamalan said, are used by all of the schools that achieve. None succeed without even one of them: leadership, teacher training, data, more time and smaller schools. He said the research found that in a successful inner-city school, principals spend 80 percent of their time teaching the teachers and developing a consistent culture. The teachers are trained “like Navy Seals” to impart a consistent message into the students, almost like a military school, he explained. Without that leadership, it’s like a “coach who’s not coaching players,” Shyamalan said. The research found that best teaching practices are studied and built over time – more time, even just another hour per day. And schools must have fewer than 550 students overall, a factor that means the school graduates nearly one extra student out of every five, he said.